We’re so proud to release Mongobooster 3.2 today. This version includes official support for MongoDB 3.4 along with some useful minor improvements and bugfix. For more information on MongoDB 3.4 , see Release Notes for MongoDB 3.4. Changed: loosen the restriction - Test Data Generator restricts to test database. MongoBooster 3.2 adds support for all the new shell methods and operations of MongoDB 3.4. Sharding Zones, Linearizable Read Concern, Decimal Type, New Aggregation Stages, Views, and Collation. MongoDB 3.4 adds a few aggregation stages for Recursive Search, Faceted Search, Facilitate Reshaping Documents, Count and Monitor. In MongoBooster 3.2, all new aggregation stages can be used as the chainable methods, rather than specifying a JSON object. MongoDB 3.4 adds support for the decimal128 format with the new decimal data type. 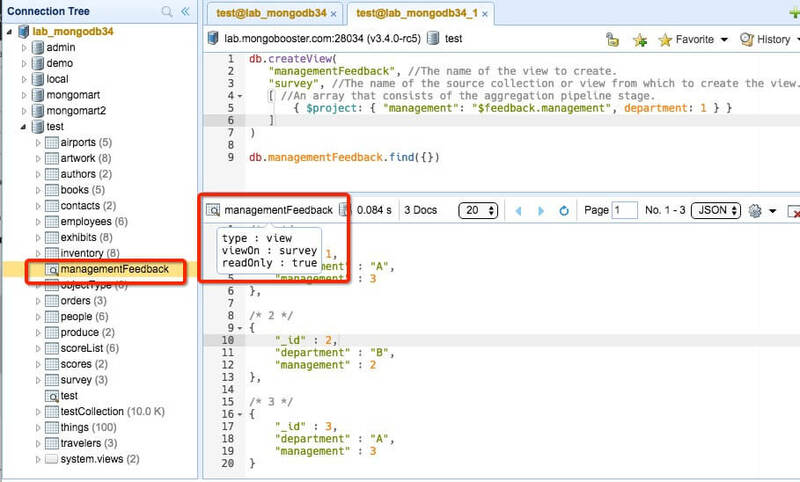 MongoDB 3.4 adds support for creating read-only views from existing collections or other views. MongoBooster 3.2 adds related shell method and GUI functions to make it easier to explorer and create. Changed, auto-complete feature restricts to “test” or “demo” database after 60 days trial expired. Fixed, not able to connect SSL enabled(self-signed ) ReplicaSet connection.